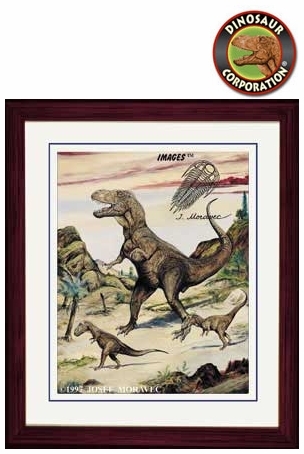 T-rex Framed Picture. Museum quality frame (17" x 14") double matted in glass. T-rex is photographic reproduction of original oil painting by Josef Moravec. Tyrannosaurus rex is in the art collection of Dinosaur Corporation. Tyrannosaurus rex, probably the most famous dinosaur ever, was a member of the family Tyrannosauridae. It was a theropod, a saurischian dinosaur, that belongs to the one of the largest terrestrial carnivores of all time. This "tyrant lizard" is the best known of all dinosaurs. T-rex was one of the most awesome creatures, that have walked on the earth. Tyrannosaurus rex was one of the largest meat-eating dinosaurs, but it is still debated, whether it was an active hunter or a scavenger. It probably fed on decaying bodies of dead dinosaurs, like most carnivores. T-rex probably lived in forests, in a humid, semi-tropical environment. Tyrannosaurus was a bipedal, it walked on two muscular legs. Each foot had three large toes, all with claws, and it also had a dewclaw. Its arms were small, each with two fingers. Tyrannosaurus rex had very large head, a short neck and a slim tail; its skull was up to 5 feet (1,5 m) long. Its eyes were faced forward, it could focus them directly to the front. Its teeth in large jaws were sharp, jagged and 6 inch (15 cm) long. It is known, on the base of fossilized specimens, that Tyrannosaurus rex had "lightly pebbled skin", bumpy, like an alligator. Its brain was comparable in size to those of modern reptiles. The first complete T-rex skeleton was discovered in 1902, and many great examples have been unearthed over the last 15 years.